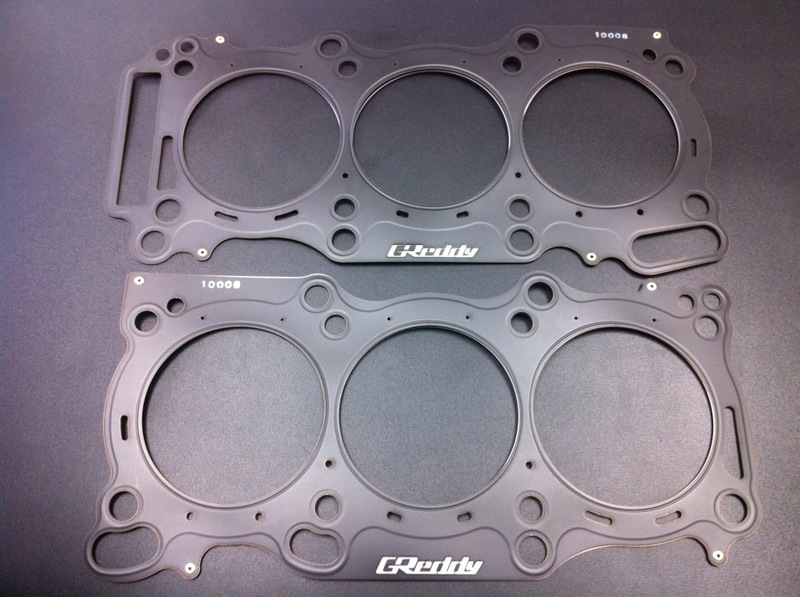 GReddy has put out some new headgaskets that have become a requirement for the big bore, big power VR38DETT builds. They tried some Cometic gaskets on big power.high boost builds, and had sealing issues. The Cometics would probably be fine at lower power levels, but they are not working on this level of build. Now they have 99 mm and 100 mm big bore headgaskets available with a stopper type center layer, to help prevent any leakage during high cylinder pressures imposed by 30+ psi of boost. We do not recommend current Cometic gaskets for high boost, big power builds. One of the reason we do not recommend them is that their center layer is almost flat with no stopper ring to better seal the cylinder. Outer layer seems good but we have seen leakage from both from deck surface and from the center layer. It leaked only at high boost and coolant overflowed from the reservoir tank. GReddy gaskets features a stopper type center layer to completely seal the cylinder by adding extra torque around each cylinders. Stopper is basically a folded center layer that gives extra thickness around the cylinder bore. This serves the same purpose as O ring but with out the extra machining for the grooves. Outer layers are coated with a thin layer of nitrile rubber to ensure good seal to the head and deck surfaces. MotoIQ had a good article giving some technical information on headgaskets, and sealing. Big power and big boost, want to try and lift the head off the block. The mixing of oils, waters, and combustion gases, makes for a bad day at the track. With a headgasket, buy a good one, get a good set of studs to pull straight down on the head, and crank the boost.